Last week when my family and I were coming up with the various tips that my grandma used for Vick’s VapoRub, one of my Aunt’s had mentioned Witch Hazel. I had never heard of it before but it sure sparked a lot of memories for my family. After a little research on my part, I discovered that Witch Hazel (funny name) is a flowering plant that grows in North America. It’s also referred to as Winterbloom. In early America, the twigs of the Witch Hazel were used as divining rods to locate water, which influenced the “Witch” part of its name. The plants extract was used by American Indians for medicinal purposes and that same extract is used today in many healthcare products. 1. Swollen Eyes – dab a little Witch Hazel on cotton balls and place them on your closed eyes for 10 minutes. 2. Itching – to reduce itching from poison ivy, chicken pox insect bites, psoriasis, eczema and even an itchy scalp. Apply witch hazel to the areas. 3. Swelling – to reduce, apply witch hazel topically to the area. 4. Burns – to soothe, gently dab on burns to help reduce pain and prevent peeling (ex. sun burn, cooking burns). 5. Diaper Rash – use a cotton ball to dab on their bottoms to relieve pain and heal the rash. 6. Hemorrhoid Treatment – dab on external hemorrhoids to tighten the skin and reduce itching. 7. Bruises – apply to bruises a few times a day to speed up healing time. 8. Acne and Blemishes – gently dab on problem area to reduce inflammation. Can be used daily to control breakouts. 9. Cuts – to clean, dab on small cuts to reduce the risk of infection and speed up the healing. 10. Varicose Veins – to tighten the veins and reduce pain and selling wrap legs in clothes soaked in Witch Hazel. We’re not exactly sure where a lot of grandma’s tips came from, but with this one we’re pretty sure that they came from my great grandma. My mom remembers my great grandma always having Witch Hazel in the medicine cabinet. My favorite on this list has to be the one for the swollen eyes. Not because I have swollen eyes but because of a story my mom told me about it. When she was little and would cry and get upset her grandmother would send her to the bathroom to wash her face and brush her hair. When my mother would return her grandmother would have her lay down and would place Witch Hazel cotton balls on her eyes. The reason this means so much to me is because this is something that my mother did for us as kids, minus the Witch Hazel cotton balls. It’s nice to know that the small things that sometimes go unnoticed are part of your families legacy. Witch Hazels can be found at most drugstores near the rubbing alcohol and hydrogen peroxide. Witch Hazel (1) image adapted from itsnature.org and Witch Hazel (2) image adapted from etsy-odpeacock under Google Labeled for Reuse Search. ** If, by some small miracle, you worked at Amway in Ada, MI and were the person my mother loaned the notebook to, please contact me. The notebook is a small (approx 6×9), black, 3-ring binder, and contains hand drawn patterns (teddy bear), recipes, tips and tricks. It would mean so much to my family to have it back. I have loved reading this series – it brings back so many memories. I always keep a bottle of witch hazel in the refrigerator. It is so delightful when you get overheated to soak a cotton ball with it and rubbed over your skin. Awesome list Robin! Where do you buy Witch Hazel?? What a great post! I'd love for you to share this or any of your great ideas at the link party going on now (and every Saturday through Tuesday) at 'Or so she says …' Hope to see you there! Thank you for sharing this at my party. I knew some of these, but not all. I used witch hazel as a kid more often. I'll have to buy some to have on hand. I pinned this. I love witch hazel. It's so versatile, and has been my go-to summer astringent for decades now! OH my gosh, I totally forgot about Witch Hazel. My mom ALWAYS had a bottle of it in the house. This post took me way back! I love witch hazel … much better than rubbing alcohol when using directly on the skin! I haven't seen witch hazel in years.I had forgotten how simply wonderful it is. Hmmm wonder what it would do for wrinkles?? Stopping by from the link up and am now your newest follower. I would love for you to stop by my blog and follow along. I just bought a bottle of Witch Hazel so these tips are much appreciated. New follower, saw you at Dear Creatives Inspiration Spotlight. Interesting! Thanks for linking up! I want to thank you so much for sharing these with us. My aunt has been battling a fungal infection under a toenail and is unable to take the prescribed medication. I told her about the Vicks and it works. I remember many of these things from my grandmother when I read yours. Regena in TN. I like hearing about the old fashioned remedies! I have a question. How did you get the buttons under "This post has been linked on:" to line up so neatly in rows??? I would love to know! Thanks. I use both daily for all kinds of things! Pretty cool! I use it everyday as my toner!! Love this stuff! I'm loving your series. 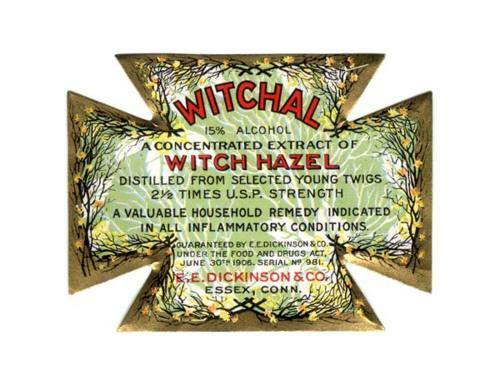 I have heard of witch hazel but really didn't know where it came from and what it was used for. Thanks for the information and for linking up at Transformed Tuesday. Wonderful, informative post. I remember my mother having it around when I was little, and I may just go out and get a bottle myself! I LOVE Witch Hazel! Hi! I found you on Sunday Social and love your blog. I am your newest follower and was hoping that you'd pop on by my neck o' the woods, stay a while, and follow back! Very helpful ideas for later! 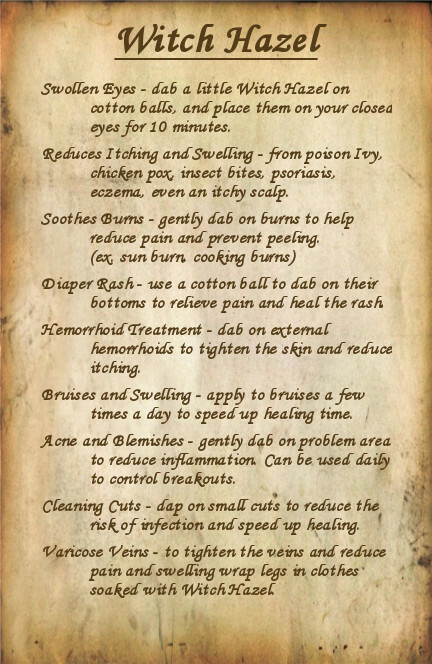 I've heard before that witch hazel is good, but have never heard of the uses, so thanks for posting this. Thanks for linking up at Romance on a dime!! I love witch hazel! Thanks for sharing! I have always known about Witch Hazel but never really knew what it was used for. Love the story about your mom. Thanks for sharing with SYC. That is a beautiful plant & I had never seen or heard of it until your post. Thanks for sharing & linking up @ DearCreatives.com Hope your having a great week! Ahh, that is the secret to varicose veins! I've enjoyed your posts on these WWII remedies 🙂 Thank you for sharing at Rustic Restorations Weekend! You always have the most amazing posts!! I learned so much. Thank you for sharing at A Bouquet of Talent. Look forward to your awesome tips each week. Have a wonderful weekend. Witch hazel is great! I use it on my eyebrows after I get them waxed. My skin is so sensitive that the skin around my eyes used to be red for days after a wax. Not so with witch hazel! It was also used on me when I had laser hair removal…the ladies would soak paper towels in it and then freeze them in baggies to soothe skin after treatments. Clever! This was an amazing thing to have after my last baby, but I didn’t know there were so many uses for it!! Thanks for the tips!! I was really surprised how many there were when we were putting the list together. I wish I had known about the one for diaper rash when my kids were little. It’s become a favorite of mine too. We just started using it for my sons acne and it’s doing a great job of clearing up his skin. 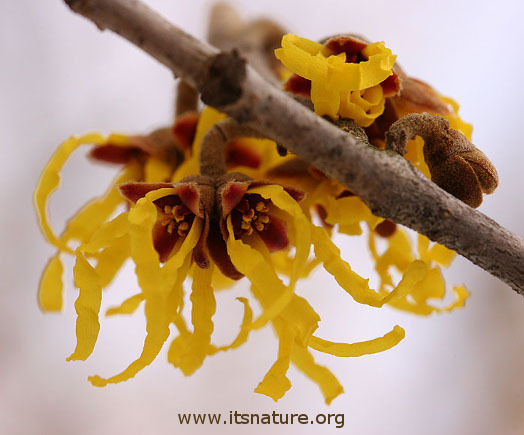 I have used witch hazel, but did not know that it is from a flowering plant. thank you for the information.